This is the second in a series of blogs to follow the journey which has evolved into the SAP Master Data Governance (SAP MDG) offering from SAP. We will next, briefly examine the evolution of the SAP MDG solution thru the SAP MDM (SAP Master Data Management). In 2004, SAP acquired a small vendor in the PIM space called A2i and used it to evolve their first Master Data Management offering, which was shipped as SAP MDM 5.5, in 2005/2007. This was an independent offering on multiple servers, viz., Import Server, Data Management Server, Syndication Server and had its own workflow for master data governance, had very detailed and fully complex architecture, its own Enterprise Service Repository, console or BASIS Admin engine, Rich Product Content Management and Print Catalog features and communicated using SAP XI or PI with other systems, for its extensive Master Data Harmonization and Central Management capabilities, which were systemically integrated with it. This was a like a one-stop comprehensive omnibus to manage SAP Master Data. 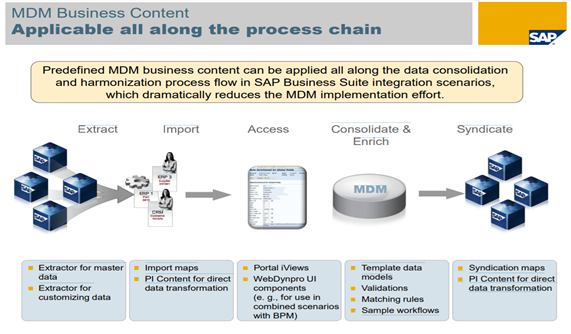 The core objects of Master Data – Vendor, Customer, Material, and Employee had their full extraction, transformation, loading, development and connectivity environments within SAP MDM and were developed, synchronized, unified, consolidated, enriched and standardized within it. This standardized, ‘one version of truth’ master data could be directly interfaced into or passed to all other consuming and utilizing systems in the landscape using key field and value mapping to push out their respective elements. SAP MDM was to be used as the central consolidation engine for all master data creation, change, and distribution to all the other systems, including to SAP 4.6c or ECC. For all these core master data objects, the core vision, was to have “one version of the truth” with all attributes maintained in a central place for all the consuming systems in the landscape, to use workflow to govern creation, change, approval and distribution of all other systems as enriched, unified, consolidated, standardized version of each master data record, keeping the pristine and comprehensive SAP MDM record as the central and core version and fully unified and integrated system of record, using a console or cockpit to administer all aspects of system functioning. Key field mapping for all the other boxes in the landscape was maintained in the SAP MDM system, and the values of each attribute of each such system were maintained in SAP MDM as value mapping to enable XI/PI to interface directly into these boxes as the unified, consolidated version of these master data records. SAP NetWeaver MDM 7.1 was released in ramp-up shipment in November 2008 and for unrestricted shipment in May 2009. An enhanced MDM technology foundation was offered along with several pre-packaged business scenarios built and ramped up in the more robust version. Global Data Synchronization is the central goal for master data. Today, it is at SAP: MDM 7.1 SP 18. At the publication level, to create publications based on the Family Hierarchy and a mask of the set of product records to include in the publication called the publication mode. While SAP MDM is an omnibus, “one-stop shop” solution for clients with very complex operations and master data for governance, who are willing to bite the bait and go along as long as the system has the necessary levels of high sophistication and complexity to accurately, and fully systematically, represent and manage their master data models, the overall client feedback to SAP was that it was very, very complex, cumbersome and unwieldy to propagate mass or large-scale use by users, other than for a few extensively trained super-users within business organizations and the larger SAP community. Also, as the box always started as non-native and outside the box and communicated with all the other more intrinsic and natively evolved SAP solutions thru XI/PI, added to more pain, cost and complexity, SAP started developing a more flexible, less complex, native ABAP, ‘within the ECC’ box, add-on Master Data Governance solution, which was more acceptable and comfortable to operate for the much larger and ubiquitous community of ECC and other super-users and users in the 2009/10 time-frame. A continuous flow of consulting feedback also triggered this natural technology evolution within SAP: towards having their own home-grown, native, ABAP-stacked solution, within the ECC box itself. The central goal was to keep the overall master data management solution modular, less complex, cumbersome, expensive and easier and more intuitive to use, but keeping a very close view of SAP MDM and making sure most of the true value propositions were ingrained and native in this new SAP MDG solution while keeping out its redundancies and excessive complexities, which makes it a better, overall higher scale version of the master data management solution. SAP’s strategic vision seems to be to wean away the existing client-base from SAP MDM gradually, to invest heavily in rapid-fire development in future versions, releases and upgrades of SAP MDG and to make it more and more native and integrated within their SAP S4 HANA on-premise, hybrid and cloud solutions and to gradually wean away all clients from SAP MDM to it. SAP started offering SAP MDG as an add-on, which could be separately activated with licensing from ERP 6.0 Service Pack 5 in July 2011. Today, SAP MDG is at 9.0 SP3.